Around 1541, the first viceroy of New Spain, Antonio de Mendoza, commissioned a codex to record information about the Aztec empire. 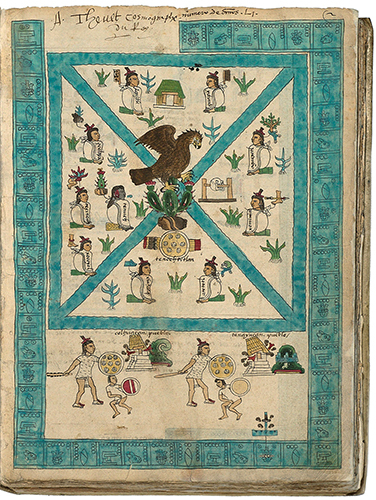 The codex, now known as the Codex Mendoza, contained information about the lords of Tenochtitlan, the tribute paid to the Aztecs, and an account of life “from year to year.” The artist or artists were indigenous, and the images were often annotated in Spanish by a priest that spoke Nahuatl, the language spoken by the Nahuas (the ethnic group to whom the Aztecs belonged). Viceroy Mendoza intended to send the Codex to the Spanish King, Emperor Charles V of Spain, although it never made it to Spain; French pirates acquired the Codex and it ended up in France. Upon its appearance in sixteenth-century France, it was acquired by André Thevet, the cosmographer to King Henry II of France, and Thevet included his name on several pages, including at the top of the Codex Mendoza’s frontispiece. The Codex contains a wealth of information about the Aztecs and their empire. For instance, the Codex’s frontispiece relates information about the organization and foundation of the Aztec capital, Tenochtitlan, or the place of the prickly pear cactus. Tenochtitlan was established in the middle of Lake Texcoco in the Valley of Mexico in 1325. Given that much of the former Aztec capital is below modern-day Mexico City, the Codex Mendoza frontispiece corroborates other information we have about the capital city and its origins. For instance, it shows us a schematic diagram of Tenochtitlan, with the city divided into four parts by intersecting blue-green undulating diagonals. The city was made of canals, similar to the Italian city of Venice, and was divided into four quarters. The image displays the quadripartite division of the city and the canals running through it. The division of the city into four parts was intended to mirror the organization of the universe, believed to be four parts aligned with the four cardinal directions (north, east, south, west). At the center of the schematic diagram of Tenochtitlan is an eagle on a cactus growing from the midst of a lake. The eagle and the cactus relate to the narrative surrounding the capital’s establishment. According to Aztec myth, their patron deity, Huitzilopochtli (Hummingbird Left), told the Aztecs’ ancestors to leave their ancestral home of Aztlan and look for a place where they saw an eagle atop a cactus growing from a rock. He informed them that when they saw this sign, they should settle and build their city. For the Aztecs, they observed the sign in the middle of Lake Texcoco, and so established their capital on an island in the lake. The cactus upon which the eagle rests also symbolizes the place name of Tenochtitlan. The cactus is a nopal, or prickly pear cactus, which in Nahuatl is nochtli. The cactus grows from a stone, or tetl. When paired together, they form te-noch to connote the place of the prickly pear cactus, or Tenochtitlan. Today’s Mexican flag similarly displays the eagle on a nopal cactus growing from a stone in the middle of a lake, relating to the mythic origins of the Mexican capital. Temple (detail), Frontispiece, Codex Mendoza, Viceroyalty of New Spain, c. 1541–1542, pigment on paper © Bodleian Libraries, University of OxfordBesides the eagle on the cactus, other figures and symbols on the frontispiece aid us in understanding the city’s foundation and early history. For instance, below the cactus and stone in the middle of the drawing is a war shield, indicating the Mexica did not settle peacefully in the Valley of Mexico. The simple structure above the eagle likely symbolizes a temple, possibly an early phase of the Templo Mayor, or the Aztec’s main temple that was located at the heart of the city in the sacred precinct. To the right of the eagle is a simplified skull rack (tzompantli), another structure found near the Templo Mayor. Different types of plants, including maize, or corn, dot the city’s four quadrants, no doubt alluding to the agricultural fertility associated with the city. Surrounding the entire page are year glyphs, beginning on the upper left with the date 2-House (1325 C.E.) and finishing (counter clock-wise) with the date 13-Reed. There are a total of fifty-one year glyphs. One year is marked—the year 2-Reed, which occurred twenty-six years after Tenochtitlan’s establishment; the reed has a cord wound around it and a fire drill appears above it. These symbols note that the year 2-Reed was the first year of a new 52-year cycle, the time during which new fire was drilled to begin the new cycle and signal the completion of the previous 52-year cycle. For the Aztecs, the New Fire ceremony occurred every 52 years—a complete cycle of the solar calendar—and it assured that the sun would rise again. Just prior to the beginning of a new cycle, new fire was drilled in the body of a sacrificial victim. After this point, the fire was distributed among people to light their homes. The Aztec World, Elizabeth Baquedano and Gary M. Feinman editors (New York: Abrams in association with the Field Museum, 2008). Frances F. Berdan, The Essential Codex Mendoza (Berkeley and Los Angeles: The University of California Press, 1997). Cite this page as: Dr. Lauren Kilroy-Ewbank, "Frontispiece of the Codex Mendoza," in Smarthistory, August 9, 2015, accessed April 23, 2019, https://smarthistory.org/frontispiece-of-the-codex-mendoza/.